Stretchable nylon fabric with hook and loop closures positions a soft silicone Gel cushion that supports the plantar fascia. Designed for wear under or over socks. Thin profile fits comfortably in most footwear. Washable and reusable for months. Interchangeable – fits right or left foot. 1 per pack. Can be worn directly against skin or over socks. 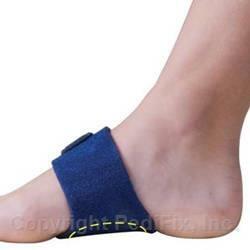 Place gel pad against the bottom of foot and position comfortably in the arch area. Pull straps up and over top of foot. Secure with fasteners. Check for comfortable fit. Trim excess strap length, if desired.